Most products are FREE within the USA except for bite resistant arm guards, cleaning spray, and gloves which have a flat rate of $5. We accept all major credit cards via PayPal and Stripe. The products we sell are custom made and quality will not be jeopardized. Professional seamstresses are employed and each product must pass a strict QA analysis prior to shipping. The process between your order and the shipment of your product is centered around quality control and not speed. We do not store vests on shelves for years prior to delivery and each item is made fresh. Therefore, please allow 10 – 30 days for delivery. We sell to LAW ABIDING individuals only. If you intend to commit a crime while wearing or using a product sold by us you are prohibited from purchasing said products. In addition, we do not sell to minors. In the Canadian provinces of Alberta; British Columbia; and, Manitoba there are restrictions as to who can possess body armor and proof of eligibility is required. Do you have Proof of Certification? What protection levels do your vest have? There are handgun threats and rifle threats. Soft bullet resistant material stop handgun rounds and fragmentation but only a rigid rifle plate stops a rifle round. 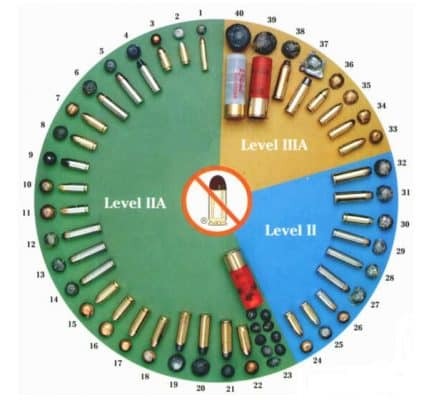 Level IIA, Level II and Level IIIA will stop the majority of pistol round plus 12 gauge and OO buckshot but no material is ever 100% ‘bulletproof’. We only sell the current National Institute of Justice (NIJ) Level IIIA 0101.06 standard, which also protects against Level IIA & Level II. We recommend staying away from the old 0101.04 standard as testing protocols have moved on since the old standard was in force! ​Rifle rounds require Level III or Level IV ballistic plates made from either steel, ceramic or polyethylene – usually 10″ x 12″ weighs from 4 to 9 lbs per plate to cover the Chest and/or Back. Doubling up two Level IIIA WILL NOT stop a rifle projectile! We accept signed PO’s from government agencies including schools/school boards.